Yeah – We’ve been around a while… And there are a few advantages of getting older; one of the best is the memories! Note the Jocko’s stickers on hoods and top wings of Gary Stanton’s #75 with Doug Wolfgang & Karl Kinser’s #11 with Steve Kinser in 1982. Nice advertising we traded for a Buffalo drill press and a Lawnboy mower !! THANKS GUYS ! Some of our early supporters were Danny & Butch Young. This is an early 1990's picture of Danny after he won a big Waterloo toolbox on a Jocko's sponsored night at Knoxville. 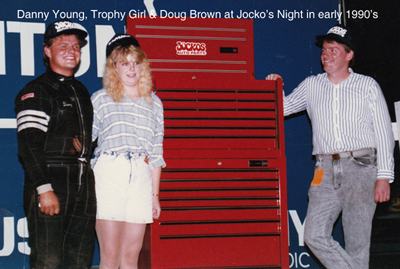 Jocko's Sprint Parts is a partial spin-off of Jocko's Auto Parts founded by Doug Brown in May of 1975. After almost 30 years and building the single store up to 10 stores and a warehouse, Doug sold the traditional business to General Parts Carquest in April of 2004, retaining the real estate and the Sprint Parts business. For many years Doug was a serious race fan and Jocko’s Auto Parts helped out several local teams and a few race teams that traveled to Knoxville as well. One night at Knoxville Bob “Booby” Thompson had blown up the motor in his 360 and Doug offered a few parts to help him get going for the next week. That was the start of a several year sponsor/friendship that led to the establishment of Jocko’s Sprint Parts. Bob owned and operated American Challenge Chassis where he built and repaired sprint cars and sold a few parts. After “hanging out” at Bob’s shop many nights, Doug saw a need for a parts source and slowly they worked into the business. Along the way Doug spent four years partnering with Dennis Moore Jr. with one of the best nights coming in 1999 when Dennis won the 360 Nationals & the 410 feature in the same night. In 2000 Doug & Bob were getting more serious about the sprint car parts business and started taking their truck loaded with sprint car parts to Knoxville every week. They were pretty well out of the racing end of things and concentrating on the sprint parts business when Dennis called and wanted to come back from California to run 360 Nationals in 2003. They took an old motor they’d bought for $6000 to Lee Nelson at Ostrich Racing Engines & had him do a quick freshen on it. Bob put a car together and crewed the car with no spares & a borrowed trailer. 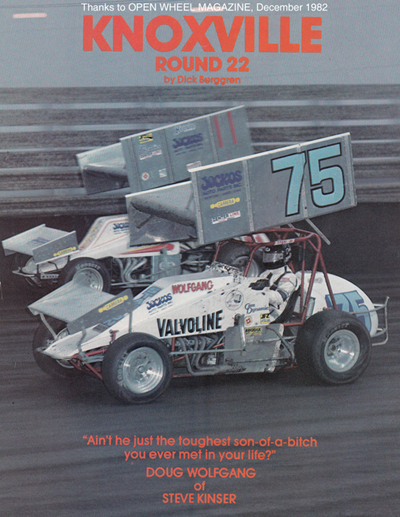 Knowing they were a little out horsepowered Bob set the car to run the bottom and Dennis came from several rows back to win his second 360 Nationals. Then as the guys were just about out of the racing business again Bob’s son Tyler turned 16 & Bob & Tyler raced a 360 at Knoxville from 2005 to 2008. In recent years Bob has restored a 1974 Toggnoti/Trostle bolt on cage sprint and runs it pretty hard (usually pulling the left front wheel) at vintage meets around the Midwest. 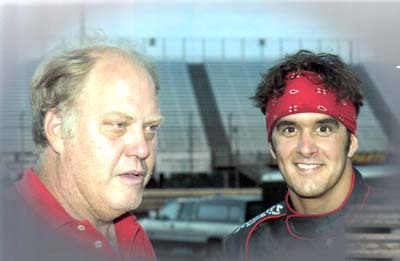 Bob has nine 360 feature wins as a driver at Knoxville and was inducted into the Knoxville Hall of Fame in 2008. Doug was honored to receive the Heritage Award at the 2010 Knoxville Banquet. As the business grew Larry Johnson & Frankie Miskimins started helping out at the track and regular customers remember Larry’s deer jerky & Frankie’s cookies (he’s the Pepperidge Farms distributor in his day job) that they were so kind to share with everyone in the pits. 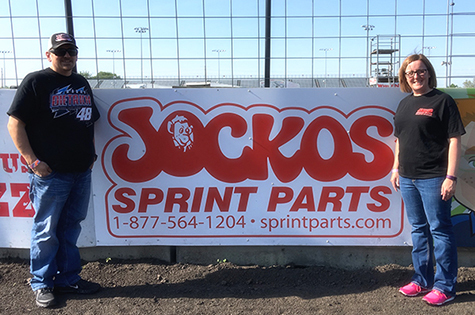 Joe Chrismore, who was very instrumental in building the Jockos Auto Parts business and is Doug’s real estate partner, helps with the business operations of Sprint Parts and also has owned and operated Riverside Raceway Motocross Track in Winterset, Iowa since 2006. Jocko’s Sprint Parts is a business that evolved out of a hobby and we intend to keep having fun with it. We are very serious about customer service and we still enjoy the thrill of competition at the track and in our business. We constantly shop our competitors to be sure our pricing is where it should be. Our fast customers and track sales experience constantly educates us on items we need to be adding to our product mix. We welcome feedback from anyone on things we could be doing better and appreciate the many compliments we’ve received about out prices and products over the years. We know our existing customers will enjoy having this new website and we’re confident that we’ll make many new customers as they find exactly what they need here. You’ll see we are TOTALLY FOCUSED on the dirt sprint car. You won’t find stock car, street rod or midget parts popping up as you search our site; just sprint car stuff. We don’t just take a few items and pile it high and sell it cheap; we pride ourselves on having all the small and replacement parts that make a parts store a parts store. Our ultimate goal is to be the best single source supplier for your race team and to earn your business one order at a time. THANKS to each and every one that has favored us with their purchases. We sincerely appreciate your business and will continue to do our best to earn your future patronage. Bob Thompson and Dennis Moore Jr. making a plan for their 2003 Knoxville 360 Nationals win! Yes, Bob has been a racer since his early years. How many guys do you know that cut and bent the tubing for their sprint car, welded it together, made many of the parts, built the engine, built the trailer & toterhome to pull it to the track, and THEN.. got in it and drove to feature wins? To those that know Bob well he’s definitely one of a kind and truly dedicated to the sport and business of sprint car racing. Bob was a welder at Challenge Chassis from 1985 to 1989 and when they closed he and a couple of guys started American Challenge Chassis company in Des Moines. After a few years Bob bought out his partners and he’s been in the business ever since. His nine 360 feature wins at Knoxville, track championship at Des Moines Fairgrounds Raceway, Crew Chief and car builder for 360 Nationals winner, and Induction into the Knoxville Hall of Fame, are just a few of the more visible accomplishments. Many a racer can tell you their own success has been assisted by some of the countless nights Bob has spent welding on customer’s frames or putting together a quick change so they can race the coming weekend. Now that the parts business requires more of his time he’s limited to how much he can actually do in his shop (next door to the sprint parts store), but he still spends most every evening there. Just this past summer (2011) on an August Monday Bob straightened and welded on the famed Hoffman sprinter after a skirmish at Knoxville on Sunday. After he fixed the chassis he sold them a few items and a “special” torsion bar and they took Kyle Larson to Oskaloosa and won that evening. Bob may have been around a while, but he’s still very aware of what many of the faster teams are doing and he will always assist our customers in getting the right parts. Bob is very patient with newer racers and can visualize your issue over the phone and help you use the right combination of pieces you have and those we sell to properly complete your race car. Anyone who answers the phone can help you with your parts order, but when you need someone that knows their way around a race car, ask for Bob. Our competitors have good parts, we’ve got good parts. Our competitors have good prices, we’ve got good prices. Our competitors have huge buildings, we’ve got a dirt road store ! !